How many copies of Cave Story does it take to fill up an SD card? Just one of each version released so far, probably. Some games are particularly memorable and brilliant, with Cave Story arguably a good example, so multiple releases are somewhat tolerated. On Nintendo systems alone Cave Story's been on WiiWare, DSiWare, the 3DS eShop — albeit with a wait of over 18 months in Europe — and as a retail remaster on 3DS. Some particularly like the 3DS eShop version due to the inclusion of additional content and lovely stereoscopic 3D pixels, though the retail version with new visuals also has its fans. Originally released at retail way back in late 2011, publisher Nicalis has reminded everyone on Miiverse that Cave Story 3D will be arriving on the eShop in both North America and Europe by the end of the year. PSA: Reminder, Cave Story 3D is headed to the Nintendo 3DS eShop in North America and Europe later this year! Get your Polar Stars ready! There could be more, too, as last year Nicalis was even querying with fans whether they'd like a physical release of the 3DS eShop version. Have mercy! In any case, this '3D' version's download début means there'll be three versions of the game available via the 3DS eShop — only two in Europe, as the DSiWare iteration never arrived in the region. Choose wisely. Glad I held off on the Cave Story release that happened in May now! Was hoping the 3D version would come to the European eShop eventually. Of course this gets announced two weeks after I bought Cave Story + on the eShop. Not that I would've bought this anyways. It's ugly as sin. The DSiWare version can't be bought from the eShop at all anymore. Only in the DSi Shop. Anyway, the 2D version already on the eShop is superior in content to this 3D remake. The only thing this one had going for it is its rarity.... And well that will be gone soon. Aww, I only bought the pixel one a few weeks back in Europe cause it took forever to get here! Should I double dip? if it's more than €10 I definitely won't double dip. As much as they shamelessly cash in on what started as a Freeware title, I want to try this because of the radically different presentation. Great to see it available for download as I can't find it in stores anymore. For those who have bought Cave Story + on the eShop already don't wasted your time with this or feel upset over getting that version. This version has ugly 3D modals, little content, and is very glitchy. After buying both. I can honestly say I haven't Cave Story 3D back in my 3DS since the launch of the 2D version on the eShop. I for one got this way back in 2011 around the original launch for $30!!!!!!!! Now it is the rarest game on the 3DS (released in North America at least). I for one loved it, but the graphics sure aren't for everyone. It is nice to play a different graphic style of the same old Cave Story. For those that have + already downloaded...don't go for this one from what I've heard that has more content. I have the retail version, a fantastic version of a fantastic game. Got the 3DS version of the original nonetheless, even if I already had the WiiWare version and the 3D version. Also, that main theme... It's stuck in my head forever. Possibly litterally. It's been for years now. 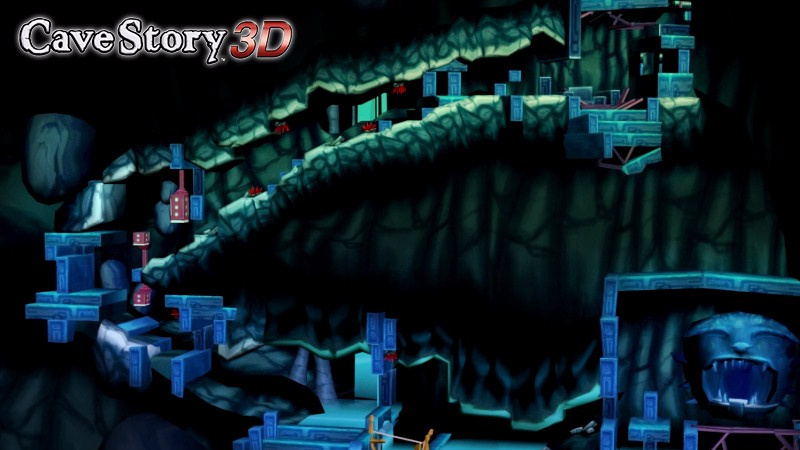 Cave Story + with 3D looks way better than this version. And it is significantly cheaper, to boot! I didn't particularly care for Cave Story 3D. The visuals were novel, but I found they made the game harder to play. The visual simplicity of the original version definitely made precise movement easier. Kind of a "don't fix what ain't broke" sort of situation. I'd stick to the original pixel art version. As a person who has played the dsi, 3ds retail, and the 3ds download I have to say the best version without a doubt is the 3ds download one that is available now. I played the 3ds retail version when I borrowed it from my library and though it is fine it is missing features that the cheaper download one has and also the 3d graphics don't make this game super appealing to look at. I mean they are neat and all but they actually make the game harder to play. I have this and absolutely hate the graphics. They interfere with the gameplay in many parts. The one on the 3DS eShop is the best version, in my opinion. Interested to see the price, considering how expensive the physical version has become. I still think I prefer the pixel-art graphics, though. Is thos game really really good? Ive hesitated buying it because of it 1)being a glitchcalis game. 2) having a similar (annoying) reputation as minecraft. Do you think playing it would change my mind? well... get the 2D version if you havent played it yet! I have Cave Story + on my PC, but I've always been interested in this version. If the price is low enough, I think I might go ahead and give it a shot! I like the new art (not as much as the original, but still). Unfortunately 3D doesn't include all the content of CS+. Hopefully they don't overprice it. I hope Nicalis can set a better price on it; it cost $40 new when it first came out. That was three years ago, and there's another Cave Story on the eShop that has more features for just $10. I'm hoping for no more than $20. Is there anything Cave Story 3D has that the port of the Steam version doesn't other than the different graphics? Eh, this version looks so stupid. Maybe it's mostly nostalgia factor messing with me, but the re-imagined graphics and music just ruin the charm for me. I'll bet it's still an enjoyable game, but I wouldn't play it over the 2D eShop version, which has got to be the best version of Cave Story ever made. It's worth playing if you really love the original. I overpayed for a physical copy on the second hand market but I don't regret it as it's nice to have a boxed version of one of my favorite games, even if it is inferior to the original. Uh, so? This game has been out for ages as retail, selling it on the eShop now is somewhat pointless (except for digital fans). Besides, the charm behind Cave Story is that it's looking extremely simple, yet employs a very distinct artstyle. But this version tries to emulate only the proportions of characters and environment in 3D, and it looks terrible. So how long until I can play Cave Story: Super Turbo Championship Edition! Gold Version on my toaster? Before or after I can play Rayman 2 on my microwave? Cave Story 3D is atrocious. It's not that they had the audacity to toy with the art style. (Though, I must admit, it looks effing awful.) It's the fact that they rebuilt the game with 1) no understanding of how Cave Story flowed and 2) no understanding of how any game flows. Just wait for the dialogues that span two screens. Were you ever hoping for a version of Cave Story that looked like crap AND made you wait through loading times between every spoken line? Then brother, this is the game for you. I beat the Wii Ware version, but I may pick this one up. Just give us the PC version of Cave Story+ (a.k.a, the best version) already. No, the current version of it on the eShop is not an adequate substitute and this one definitely won't be. It sure took long enough. @ted-k ill add it to my wish list then, I gotta admit i really like nicalis games, even if they do live up to their bad reputation. I'll never understand the hate for this game. As a Cave Story fan, seeing the game get a full retail release with 3D Graphics is really cool to me. I don't think the graphics are bad at all, and it adds really nice backgrounds to a lot of the levels. Anyone that has played Cave Story knows that the backgrounds are usually just one small pictured tiled out throughout the whole area. This version fixes that problem. The only problem I have with this game is that Wind Fortress and Curly Mode are missing for some reason. @Gorlokk from gameplay videos I have seen, it seems the platforming is harder because of the graphics, and some enemies blend into the backgrounds, which never happened in the original game. That and the missing modes is what I guess people dislike about this version. You named exactly why people don't like this version. It's a full price version of the game for less content (missing curly mode and wind fortress). Also, most people don't like the updated graphics. I know I don't, So paying full price for less content and worse graphics is a jarring idea. "Anyone that has played Cave Story knows that the backgrounds are usually just one small pictured tiled out throughout the whole area. This version fixes that problem." How is that a problem? like, at all? It looks absolutely fine. I couldn't care less. The graphical style is confusing and just plain ugly, and it's a lot more expensive to boot. Outside of the PC version of Cave Story+, the eShop version is the definitive version of the game (although I do wish it had the holiday theme cheats from the WiiWare version).